In Cell II (1991) – Louise Bourgeois, encloses a mirrored table within a circle of wooden doors. 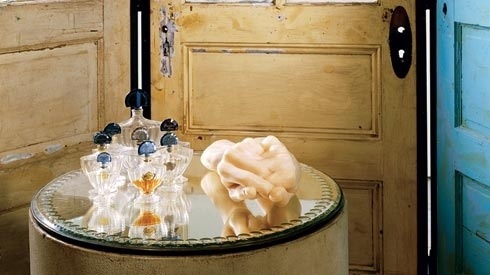 On the table lies a sculpture of wringing hands, and bottles of empty or half empty of Guerlain’s perfume, Shalimar. A perfume which was inspired by a love story.. And the table feels it could be a lady’s vanity table. The perfume is used up or dried away in the installation, there is memory of it though, the power of scent – all that is left are memories that do not wish to go away….